Medicines used to help cure skin problems might prove to be vital in the fight against multiple sclerosis. US scientists have found that two drugs may promote the body’s own stem cells to replace brain cells, which are affected by the disease. The two treatments are normally used to help cure eczema and athlete’s foot. However, researchers at Case Western Reserve laboratory found after tests on mice, the medicines helped to stimulate brain cells. They published their findings in the scientific journal Nature on Monday. The research team used state-of-the-art microscopes to analyse their findings, which they said helps to reverse the effect multiple sclerosis (MS) has on the brain. 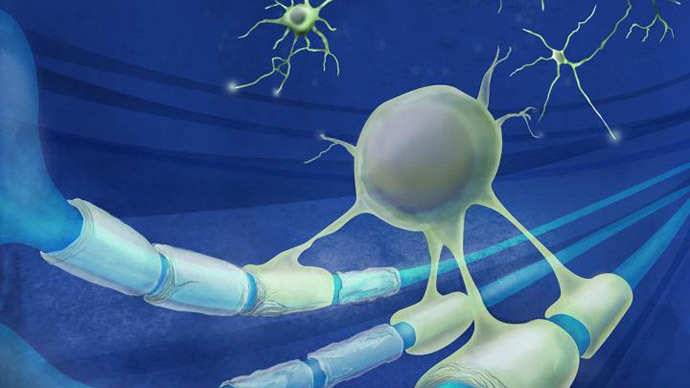 "We know that there are stem cells throughout the adult nervous system that are capable of repairing the damage caused by multiple sclerosis, but until now, we had no way to direct them to act," co-author Paul Tesar said in a press release. "Our approach was to find drugs that could catalyse the body's own stem cells to replace the cells lost in multiple sclerosis," Tesar added. The new findings could potentially help millions of MS suffers around the world. The disease is the most common chronic neurological disorder among young adults, the press release added. The disease is caused by the destruction of a protective coating, called myelin, around nerve cells in the brain and the spinal cord. Myelin is important as it surrounds and insulates the nerve fibres. Once a patient has contracted MS, the person develops physical and mental problems, such as the ability to walk and memory loss. Currently MS is considered to be incurable, and existing therapies are only aimed at slowing down the debilitating process. However, the Case Western Reserve team’s work suggests a brand new approach. When new myelin is created within the nervous system, the body is pushed “to resort to its ability to repair itself”. "To replace damaged cells, much of the stem cell field has focused on direct transplantation of stem cell-derived tissues for regenerative medicine, and that approach is likely to provide enormous benefit down the road," said Tesar. The US team say that a lot of work still needs to be carried out before it can be seen as an effective cure in the battle against MS. The researchers need to work out whether the product could be viable in the long term or if it has any possible side effects.